We invite you to Find and Try Paddling on the Edge this summer! 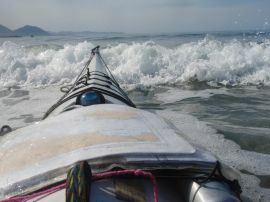 Like skiing, paddling a sea kayak can be a relaxing cruise, or similarly "on the edge"! Physically, the location of West Coast Expeditions' uniquely comfortable base camp is perfectly perched on the outer edge of Vancouver Island on a little paradise called Spring Island, which many seasoned kayakers consider to be "The Perfect Island". Actually, this is also the outer edge of Canada and the only island of its kind on our west coast! British Columbia and Canada's "edge" for many international visitors is our majestic wilderness like this for ocean kayaking. Everybody has their own reasons for choosing to kayak. For some, simply sitting in a fibreglass shell at sea level is something completely new and thrilling - feeling like you're pushing previous boundaries and living on the edge. For others, that edge involves new places, fresh wildlife, and challenging yourself in dynamic sea conditions. Like the myriad of skis out there, each kayak model has its own personality that gets further defined by you, the user. The edge - or chine (shape of the transition from the hull to the deck, through the waterline area) - of the kayak determines the kayak's potential for stability and manoeuvrability. As the person in the saddle, your body position and paddling skill allows you to control things, making optimal use of this edge. This of course depends on "what floats your boat" - what you're after! 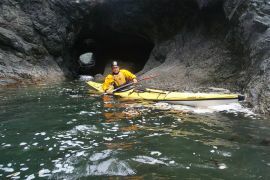 We match people with kayaks that have comfortable stability characteristics suited to their skill level and interests. We have been industry leaders for over 40 years - specializing in personalized and refreshing experiences that connect people with the spectacular west coast in remote Kyuquot Sound. Few have travelled here. Our group sizes are small and appropriate for a truly relaxing vacation in this marine wilderness. Our professional guides are adept at offering skilled instruction, tailored to your ability and interests. Our kayak fleet offers a diverse mix of doubles and singles. Our location offers sheltered and exposed waters, and diverse wildlife and Aboriginal cultural experiences. Our days are as full as you want. 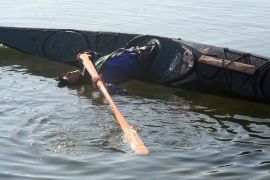 West Coast Expeditions will have you paddling on the edge - however you define it. Whether you're already familiar with kayaking or new to it, you'll find that our Base Camp Kayaking options have something for everybody - whether travelling on your own, as a couple, or as a group of friends or family. 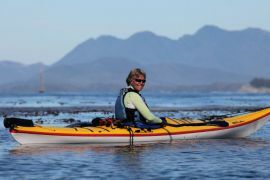 Experienced paddlers may want to join one of our fully catered Kayaking Expeditions that further explore this wilderness paradise, one step more remote and unplugged from the comforts and conveniences of the base camp. If you're more interested in building your knowledge and skills for your own kayak trips, you may enjoy a customized Instructional Kayak Course or Tour. For group bookings, any of our tours can be modified to have more of an learning focus. Please enjoy surfing through our website! For any of our scheduled adventures throughout the summer, please take advantage of our early booking promotions if wanting to Book Now for some paddling on the edge! Keep in touch by signing up for our email newsletters and following us on Facebook. We look forward to paddling with you in Kyuquot.